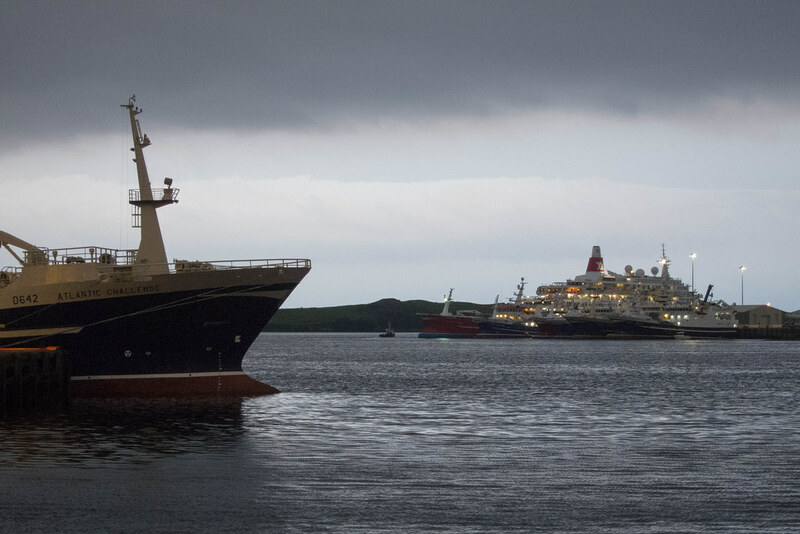 After a long day of visits to Ardara, Glengesh Pass, and Glencolmcille, we stopped in Killybegs for dinner. I was exhausted, and just wanted to go straight home. It took some doing, but Margaret convinced me to stop for photos in the harbor. 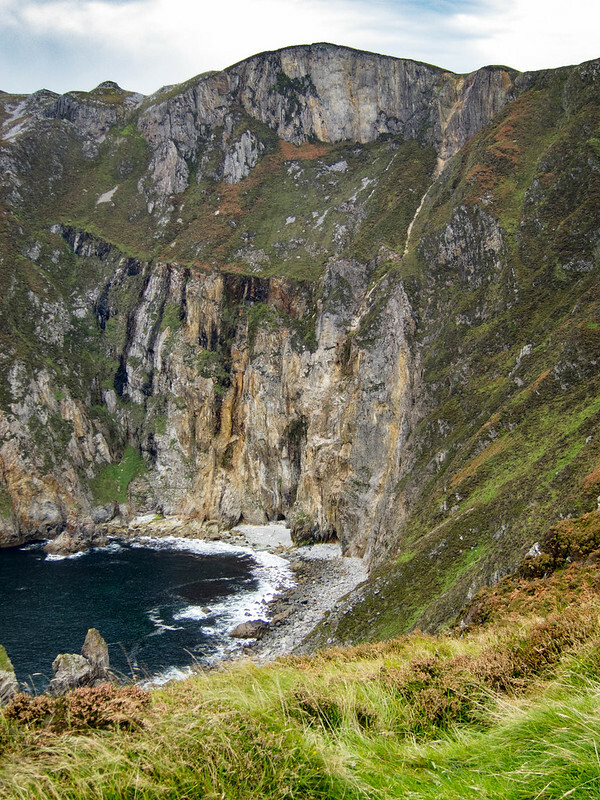 Ireland has no shortage of cliffs overlooking the ocean. 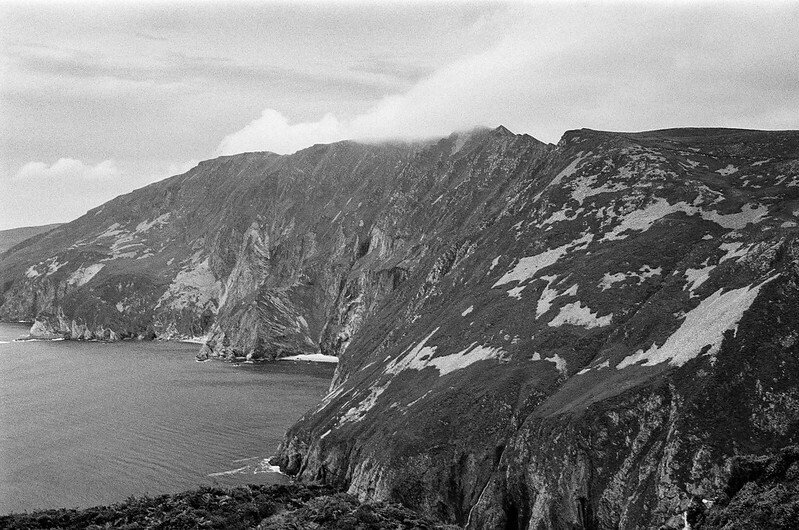 Some of the highest — nearly 2,000 feet above sea level — are at Slieve League, in western County Donegal. For Margaret and me, this was the last stop of a very long day. We’d packed too much in: Ardara, Glengesh Pass, Glencolmcille. And by the time we got here, the weather had taken a turn toward strong wind and spitting, stinging rain. But along with our raincoats and waterproof shoes we had a stubborn desire not to miss this place. We were pooped, and looking back on this selfie of us now I think we look pretty wrung out. But we were happy to be here. I shot both my Canon S95 and my Nikon N2000 here. Even though it was hazy cloudy, I got pretty good definition and contrast from the T-Max 400 film. Descending and heading toward our car, we realized we’d pushed too far. We were exhausted and famished. We drove to the nearest town, Carrick, to discover the one pub was taken over by a wake. 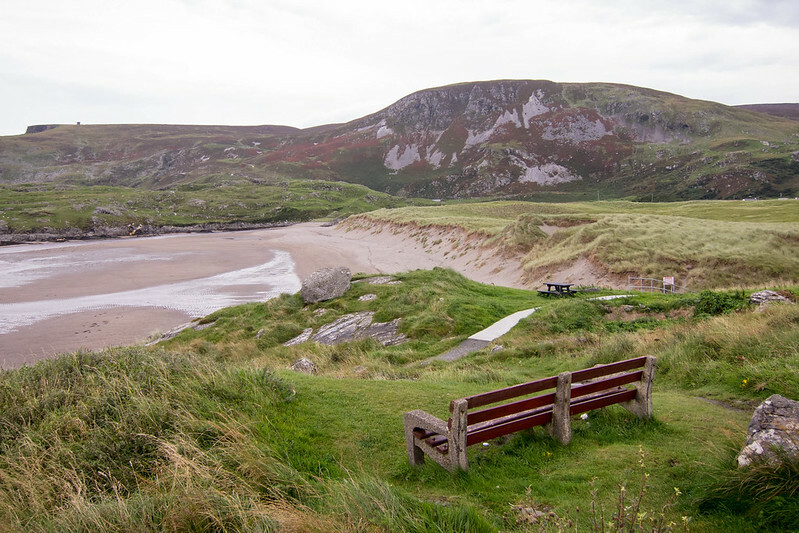 We drove on to Killybegs, another half hour along a winding road, to finally find sustenance and rest. Christians get a bum rap these days as being bigoted and small minded. Perhaps it’s because some high-profile people who claim to follow Christ behave that way. Perhaps it’s because many people experienced a rule-based, condemning Christianity as children. 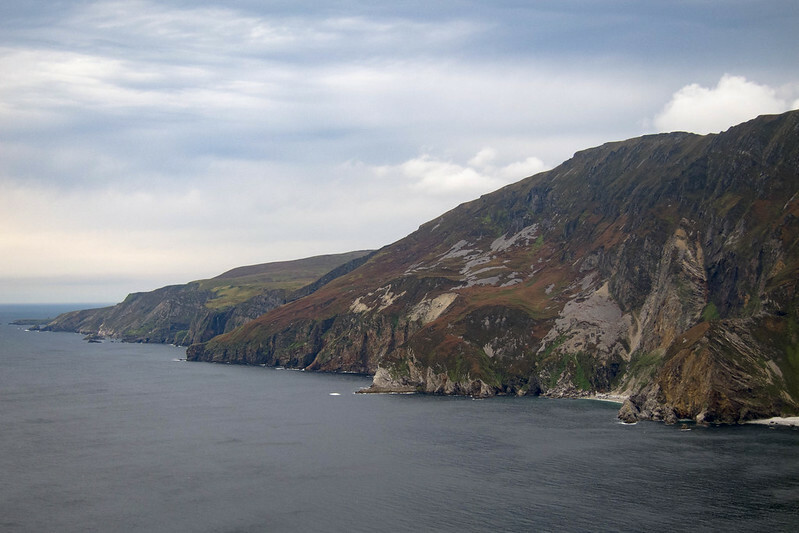 Glencolmcille. Imagery © 2016 Data SIO, NOAA, U.S. Navy, NGA, GEBCO Landsat. Map data © 2016 Google. But most Christians I know go quietly about their faith. The ones who live it out are involved in the lives of others, especially others in need. That’s what our faith is supposed to be: simply but actively passing along to others the love God has for them. 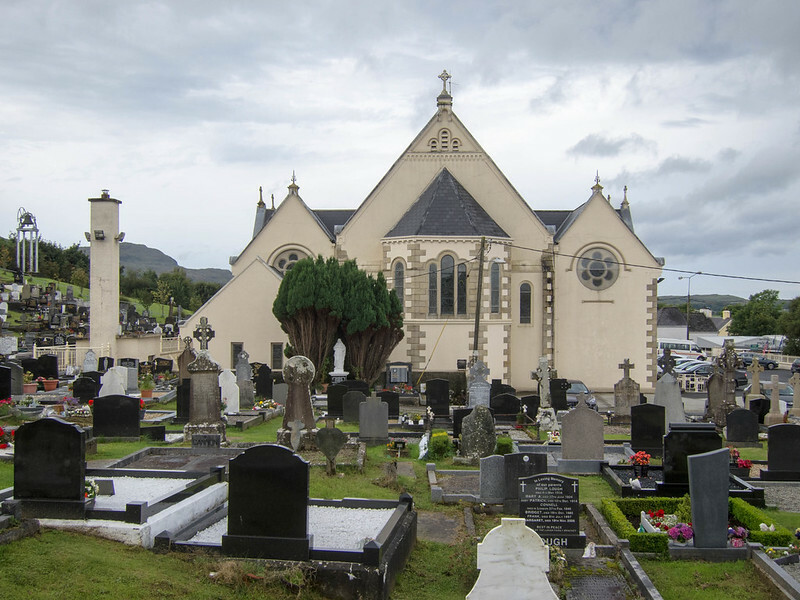 When Father James McDyer was assigned in 1951 to the remote Irish parish at Glencolmcille (Glen-column-keel) in western County Donegal, he found a people isolated and in poverty. Little paid employment was available. There was no industry, no electricity, no running water, and hardly a paved road. 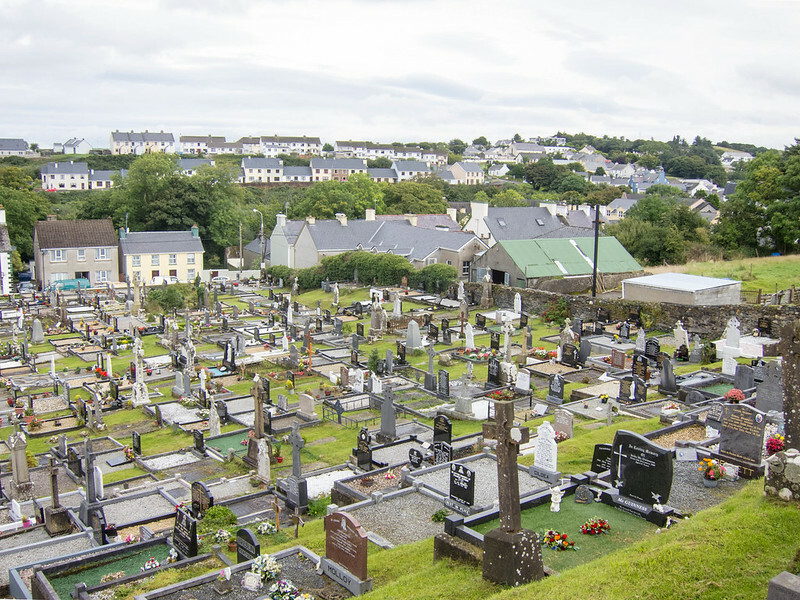 The rural people of Glencolmcille scratched out whatever bleak livings they could. 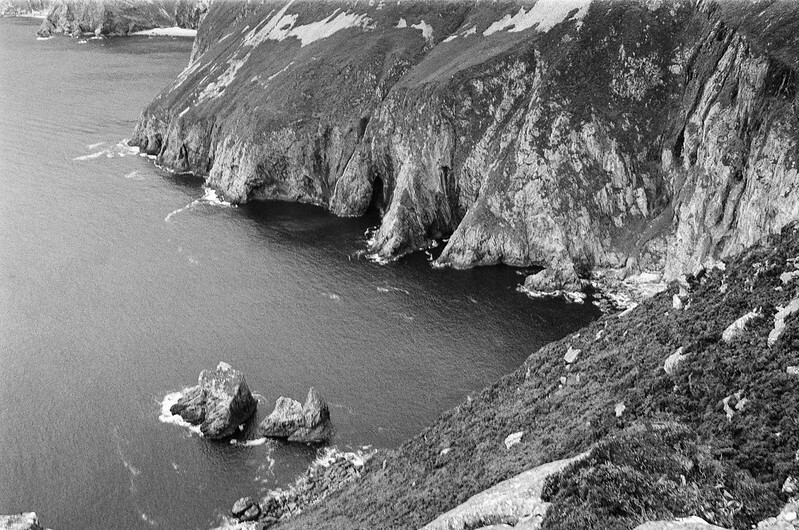 McDyer, born 1910, grew up in County Donegal. He knew this life. He saw many of his neighbors emigrate out of Ireland looking for better lives. 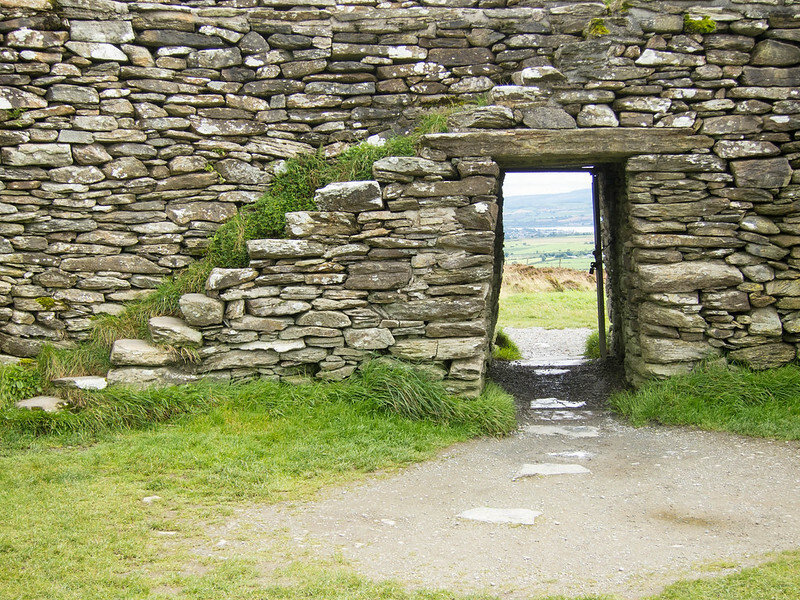 It was part of a great outmigration; scores left Ireland in the early and middle 20th century. 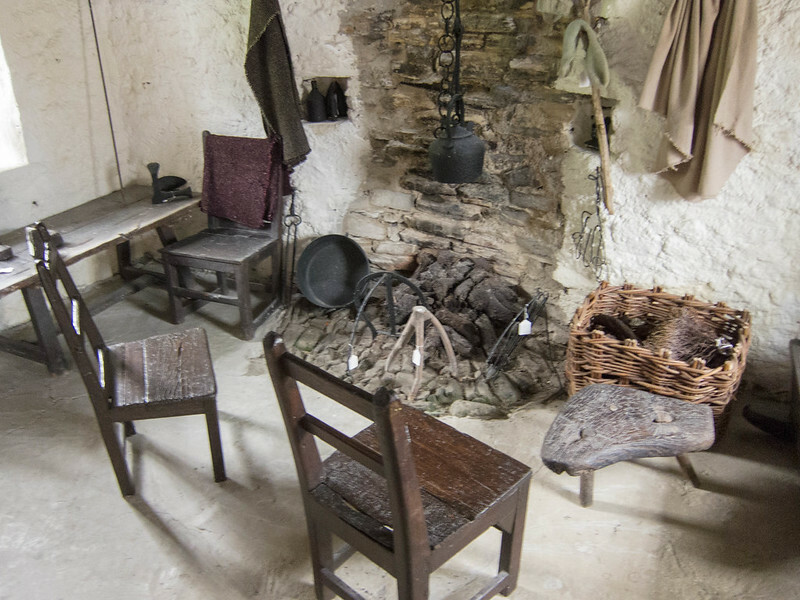 The folk village at Glencolmcille shows the conditions the people lived in when McDyer arrived. 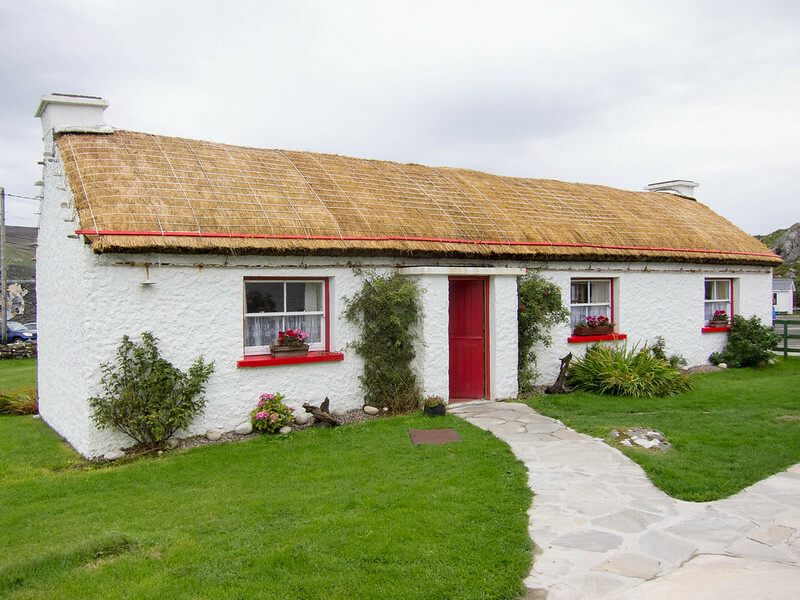 These thatched-roof huts, some original and some replicas, contain furniture and home goods typical of 1950s rural Ireland. To an American, “1950s” calls up images of suburban ranch houses and station wagons, televisions and refrigerators, freeways and skyscrapers. These simple dwellings and plain possessions are more in line with an American concept of the frontier eighteen fifties. McDyer set to work improving the peoples’ condition. 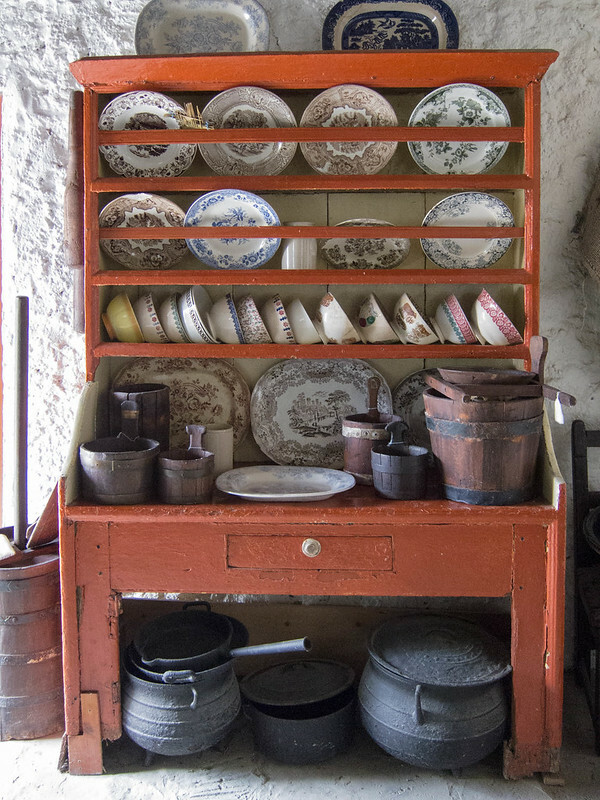 Irish farm life was largely confined to the family. McDyer saw that bringing people together, under common causes and in support of each other, was the key first step. He led them in building a community center, which volunteer labor completed in 1953. He then worked to electrify Glencolmcille. 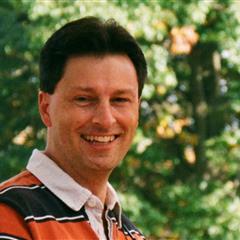 He spent many of his days traveling, speaking to government officials to move his goal forward. Here he met stiff challenges, as the Irish government was heavily focused on attracting multinational corporations as the way to bring Ireland out of economic depression. This left no resources for rural areas. He was not above manipulating the system to meet his ends, and meet them he did, as electricity came to Glencolmcille in 1954. McDyer also worked to create a municipal water supply and to pave the roads leading to Glencolmcille. In the early 1960s he spurred the creation of local industry in the form of industrial and agricultural cooperatives that processed vegetables and fish and created knitted goods. 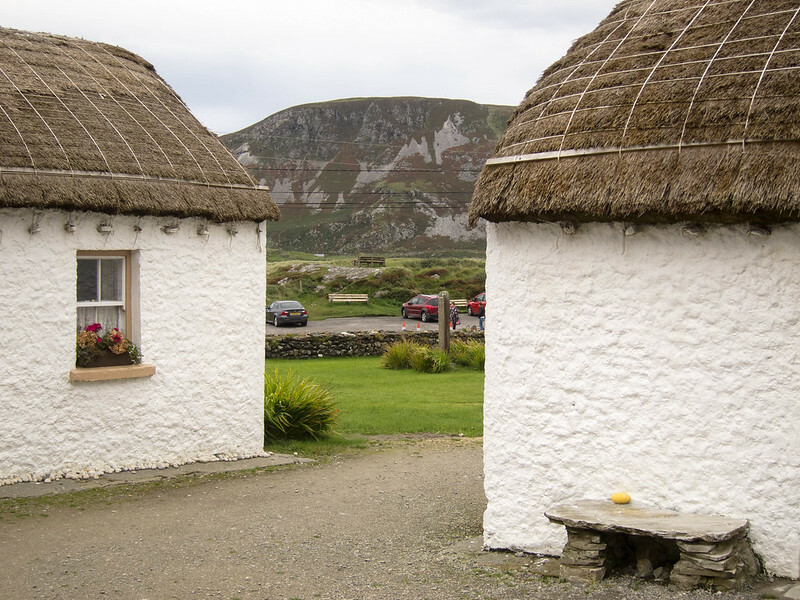 Finally in 1967, recognizing that tourism should be a vital part of Glencolmcille’s diverse economic portfolio, he led the creation of the Glencolmcille Folk Village. 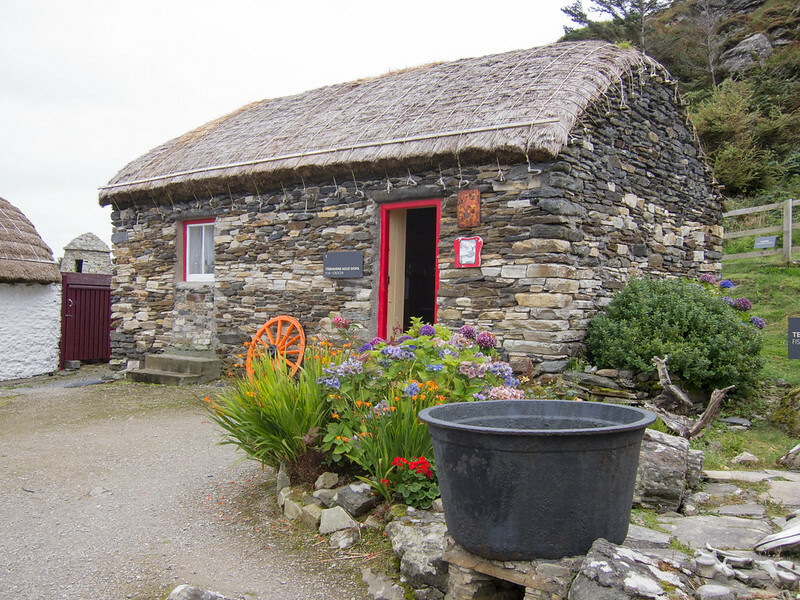 The Folk Village continues today as a tourist attraction. For a few euros, you can tour the impeccably maintained huts. One hut is a school. 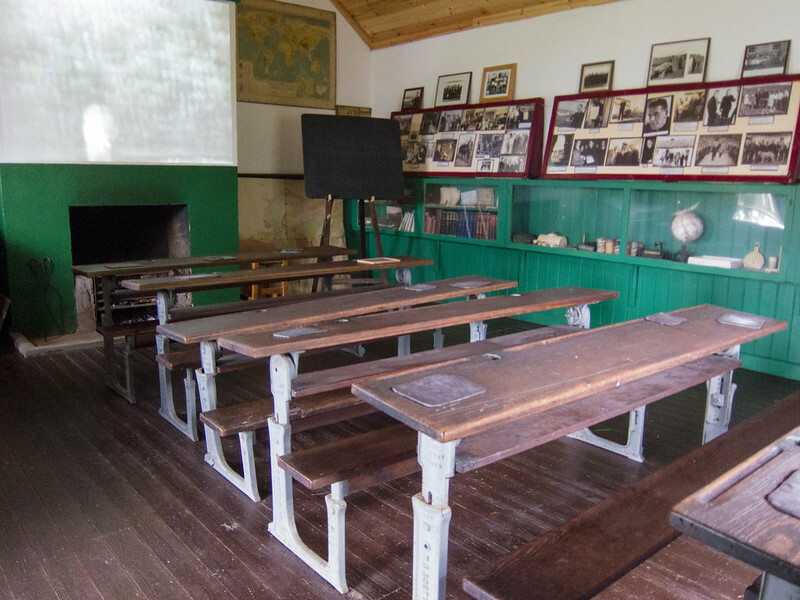 Pupils here wrote on slates until the early 1960s, when inkwells finally arrived. By this time, of course, American schoolchildren were moving away from fountain pens to ball-point pens. 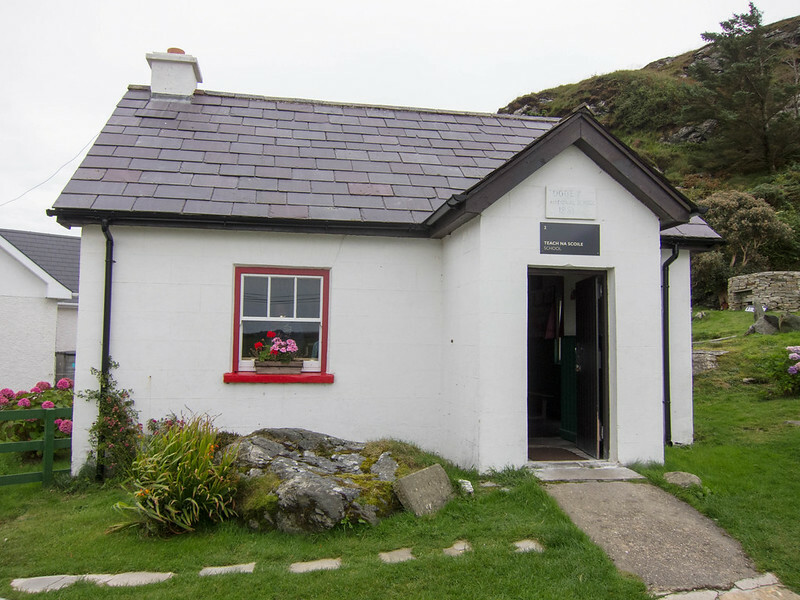 One hut is a typical home, another is set up as Father McDyer’s home and contains his personal possessions, and yet another is a general store and tiny pub. Together, they are a microcosm of centuries of rural Irish life. 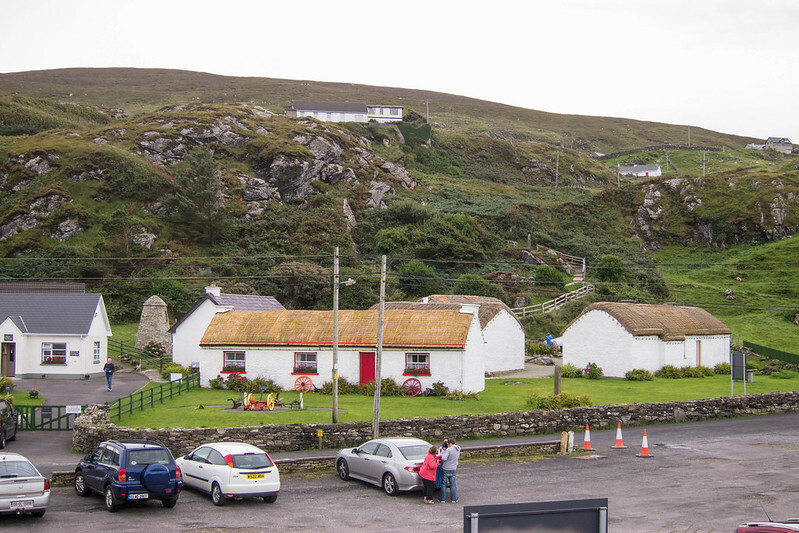 Before and after McDyer brought such life-changing improvements to Glencolmcille, the people certainly enjoyed a beautiful place to live. Hills and cliffs overlook the coast with its beaches. A horseshoe-shaped lagoon empties into the Atlantic Ocean. But surrounding natural beauty doesn’t feed families. 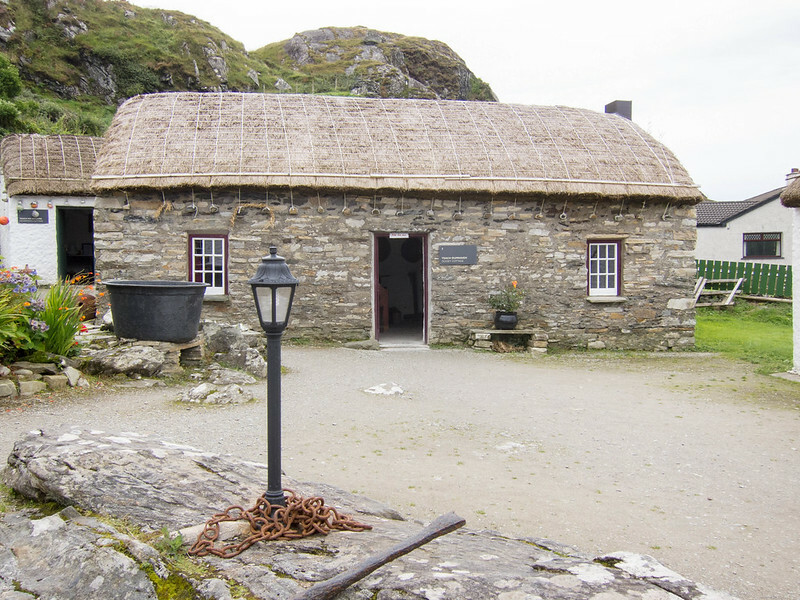 McDyer’s efforts lifted Glencolmcille’s families out of abject poverty. James McDyer died in his sleep in 1987, leaving behind a region much improved, a people in much better condition. This, then, is what a Christian, what Christianity, is supposed to do: seek the marginalized and help them improve their condition — and through this, help them meet and know God. Such gifts are not often given in this world. That these gifts are attached to a person doing God’s work, that they ultimately come from God, is what attracts people to the faith. It is the experience of God’s love and gifts on earth, and it is compelling. Imagery © 2016 Data SIO, NOAA, U.S. Navy, NGA, GEBCO Landsat. Map data © 2016 Google. 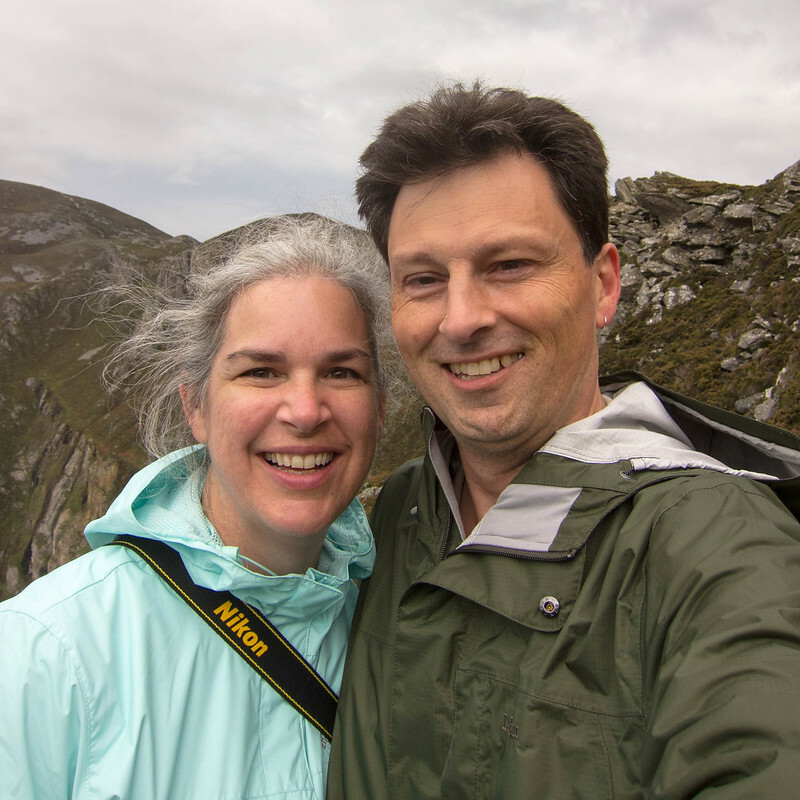 Margaret and I loosely followed the Irish coast as we worked our way south from Ireland’s northern tip. 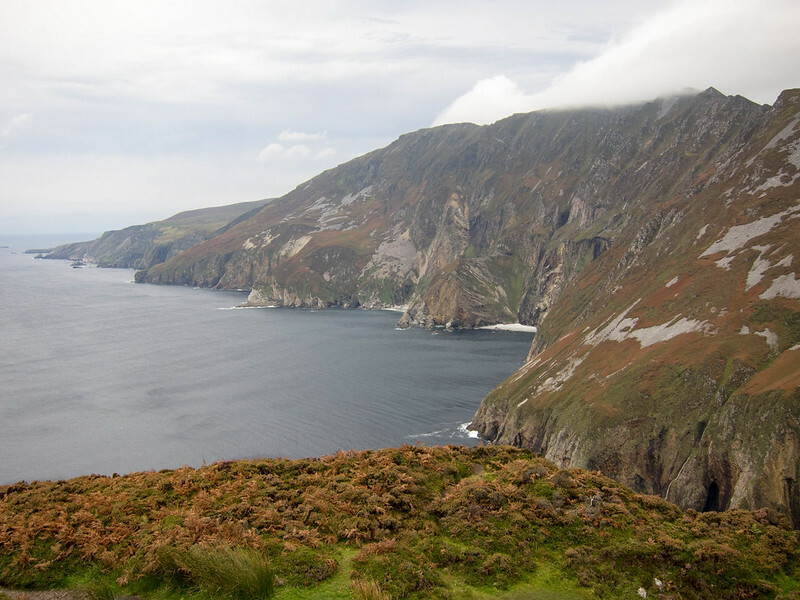 This frequently put us on the Wild Atlantic Way, a byway of sorts that traces the entire western Irish coast. When we figured out what it was, we decided to follow it wherever we could. 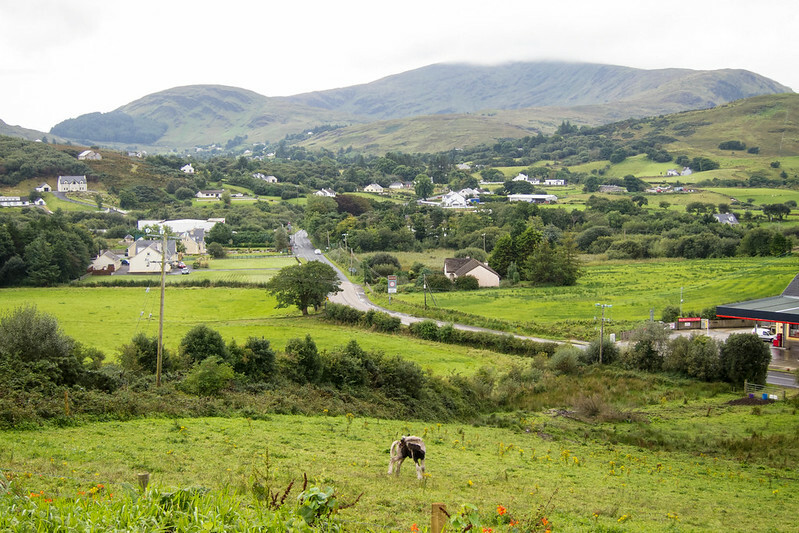 This led us directly to Ardara, a town of less than a thousand in County Donegal. (See the pinpoint on the map.) Cheerful and tidy just like every other small Irish town through which we passed, we decided to stop and look around. We found the tourism office, where a friendly and helpful woman told us of all that Ardara had to offer. But the one thing she didn’t need to tell us about was the church — there’s no way you can miss it as you drive into town. 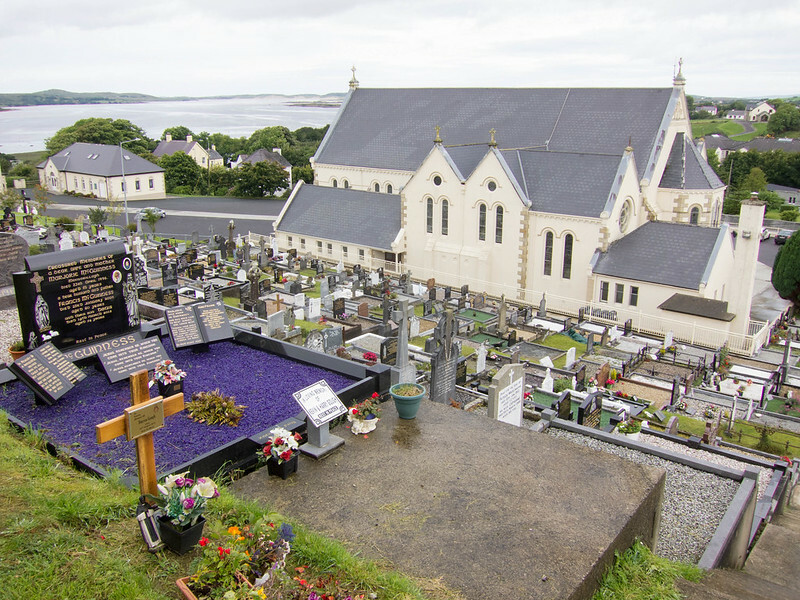 The Church of the Holy Family is surrounded by a tightly-packed cemetery. Both Margaret and I like cemeteries. Neither of us knows exactly why. 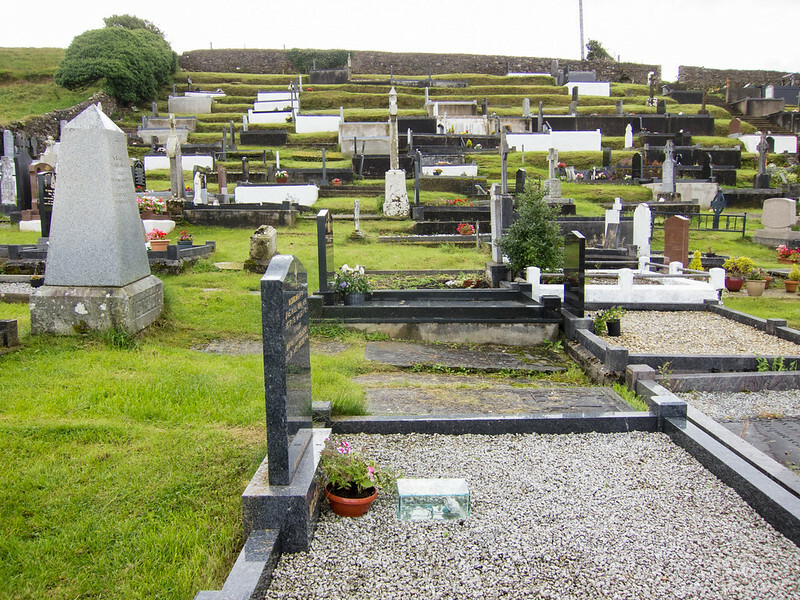 The property leads up a hill, which was terraced to provide level ground for more graves. We’d never seen anything like it, and we’ve walked through a lot of cemeteries. 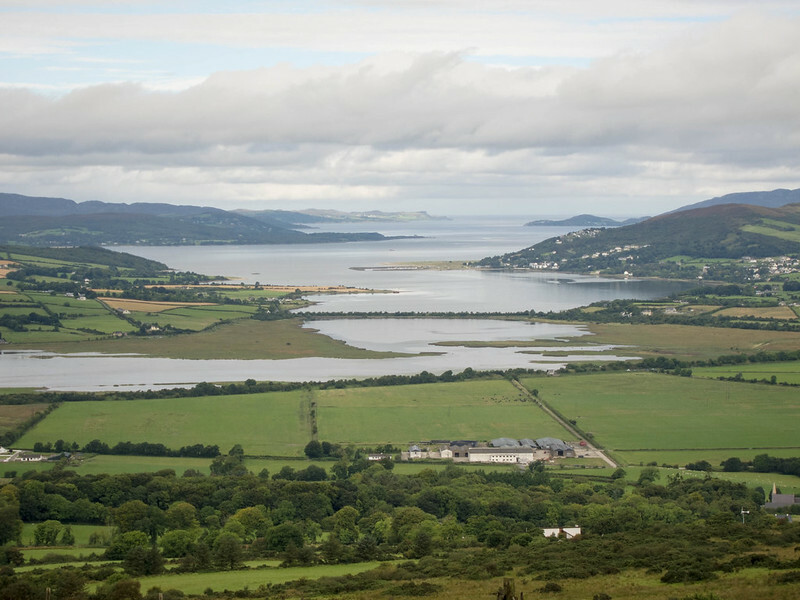 …and on the right, Ardara itself. What it it about being at the top of the hill that makes a man want to linger? I stood up here for quite some time, breathing the air and considering the views. I concluded nothing of merit, but I still felt better when I came down. The Church of the Holy Family was built in 1903. 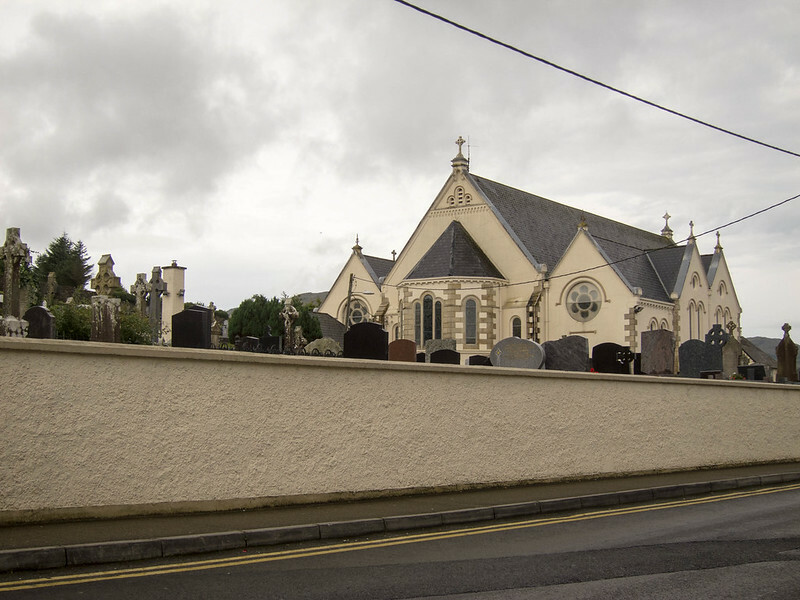 It’s not as grand as the cathedral in Letterkenny, but Letterkenny has more than 20 times the population. 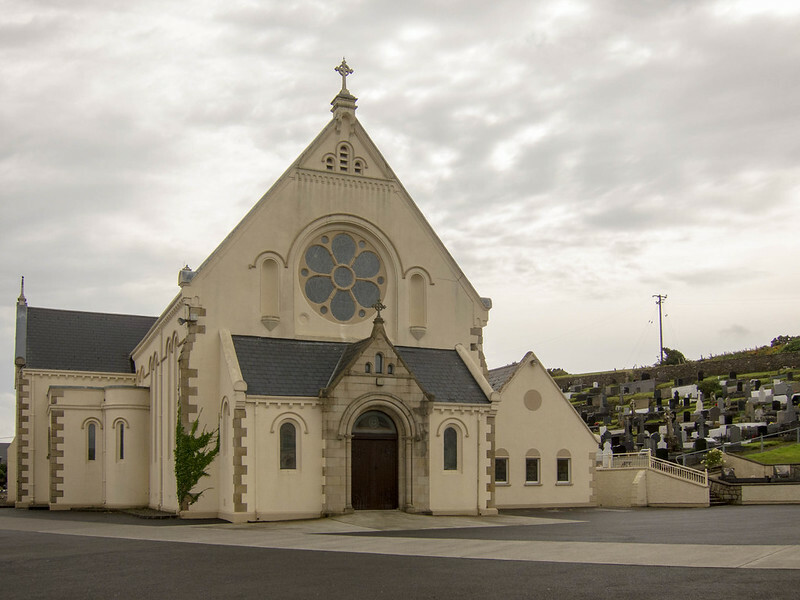 This is a fine and lovely house of worship for the people of Ardara. The woman at the tourism office told us about a nearby waterfall and also about a deep scenic valley called Glengesh Pass. We drove around for a half hour on frighteningly narrow back roads but never found the waterfall. Glengesh Pass, however, was impossible to miss. I’ll share stunning photos from there in an upcoming post. 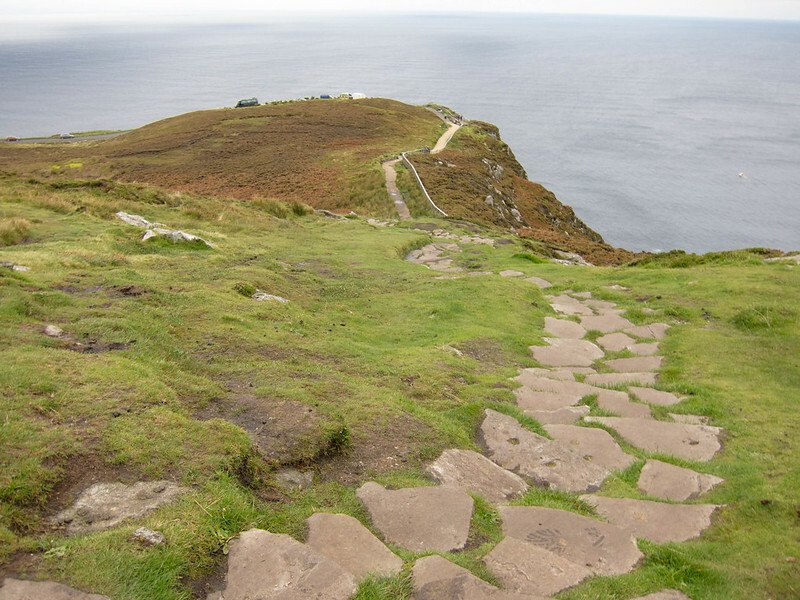 Where the Inishowen Peninsula begins, way up near Ireland’s northernmost tip and not far from the border with Northern Ireland, a series of narrow country roads take you high up a hill to this structure. 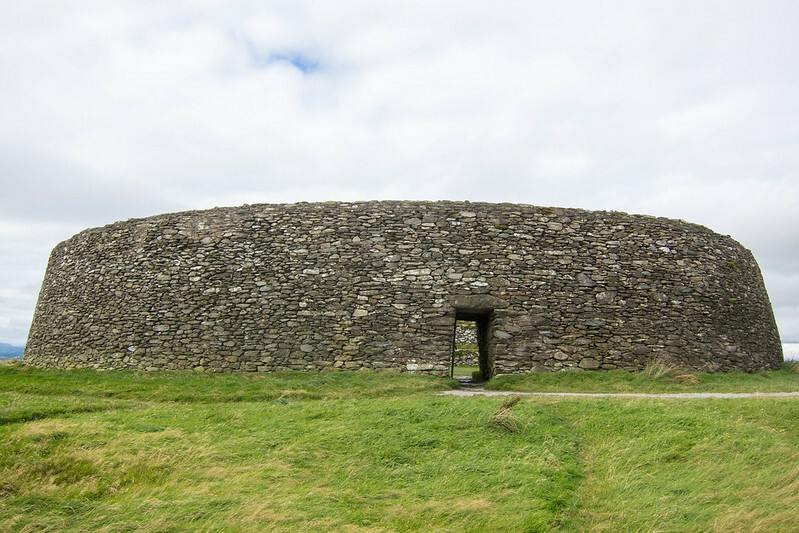 It’s a ring fort, a round structure of stone, thought to be built during medieval times. There’s some disagreement about the timing and history of ring forts, actually. But thousands of them dot Ireland. Some were made of earth, some were made of stone, and most of them lie in ruin. 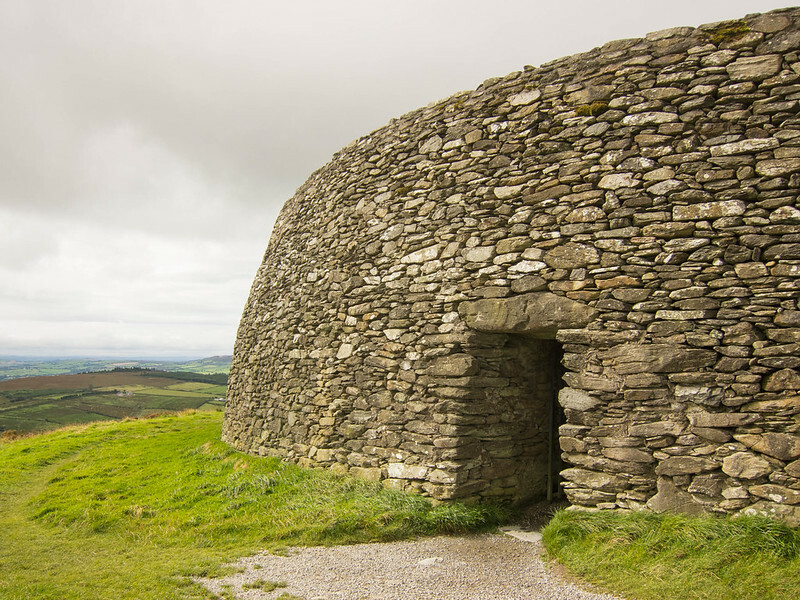 This one, at a site called the Grainan of Aileach, is one of the best known and most prominent in the nation. 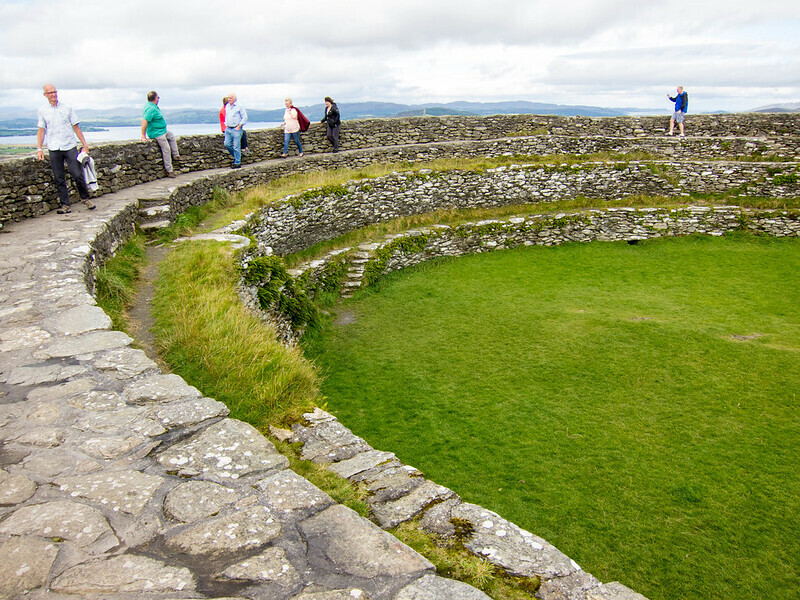 It served as the seat of the ancient Kingdom of Aileach, which encompassed a lot of the northernmost portion of Ireland. Ring forts were used as farm enclosures for wealthy landowners and may have provided a little protection from anyone who might want to cause harm. But it appears that their primary purpose was to establish status at a time when hierarchy was everything: the more elaborate the design, the wealthier you were. Kind of like how we buy cars today: a long, lean, black Mercedes sedan says something about you that a Chevy Impala does not. There’s no doubt that a fort has stood at this site since at least the second century, because it is marked on the map of the known world that Greco-Egyptian mathematician, astronomer, and geographer Ptolemy created then. This fort was probably first made of earth. I’m not quite sure when it was rebuilt of stone, whether before or after any of the three times it was destroyed. The last time was in 1101. 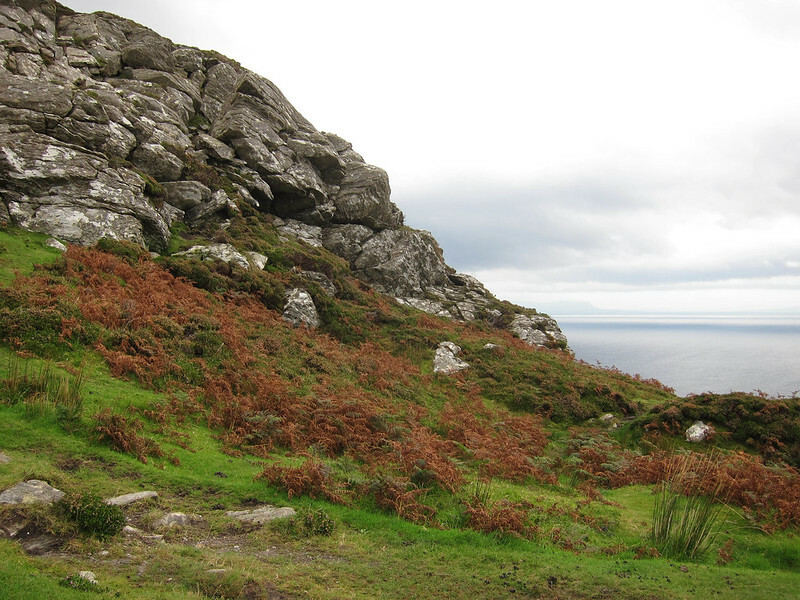 When the site was surveyed in the 1830s, the fort lay in ruin. Its current condition is owed to restorations. The first happened in the 1870s and the most recent in the early 2000s, both criticized for altering the original design. The fort’s current condition probably evokes its past more than it accurately reflects it. But it is no less interesting and astonishing to visit than if it were still all original. Despite its location far off a major road it attracts plenty of visitors. On the weekday morning Margaret and I visited, more than a dozen others joined us to climb the steps and explore the fort’s three levels. 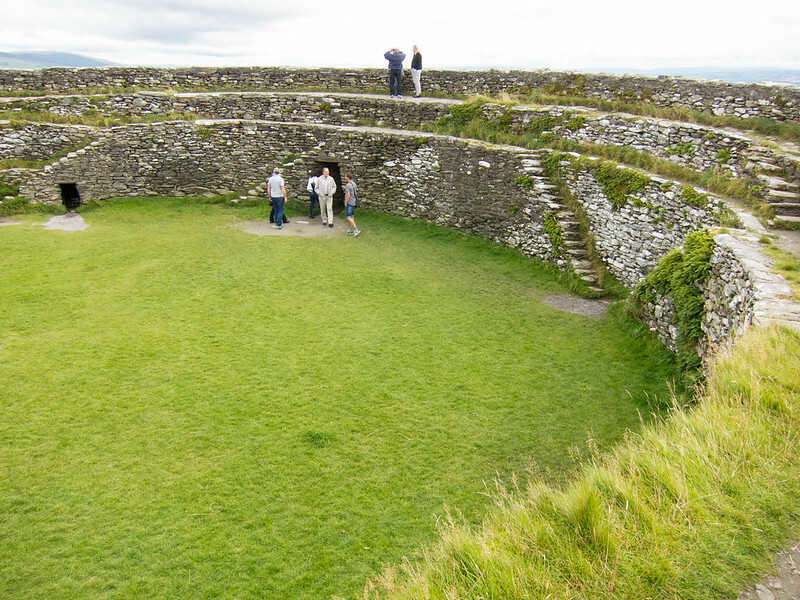 Originally, there would have been buildings inside the ringfort, which is about 75 feet in diameter inside. The wall is about 16 feet tall, and at its base it’s about 15 feet thick. It is built mostly without mortar. 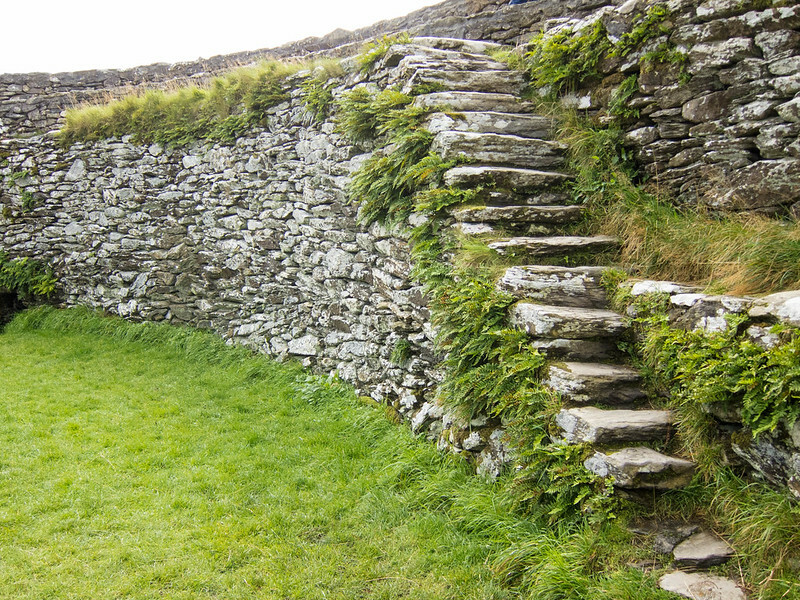 We assumed that where we found mortar, it was added for stability so that visitors could safely climb and walk the fort. Perhaps this is one of the criticized aspects of the restorations. But I was glad to be able to confidently stand up there to take in the views. It is said that on a clear day, you can see five Irish counties from here. 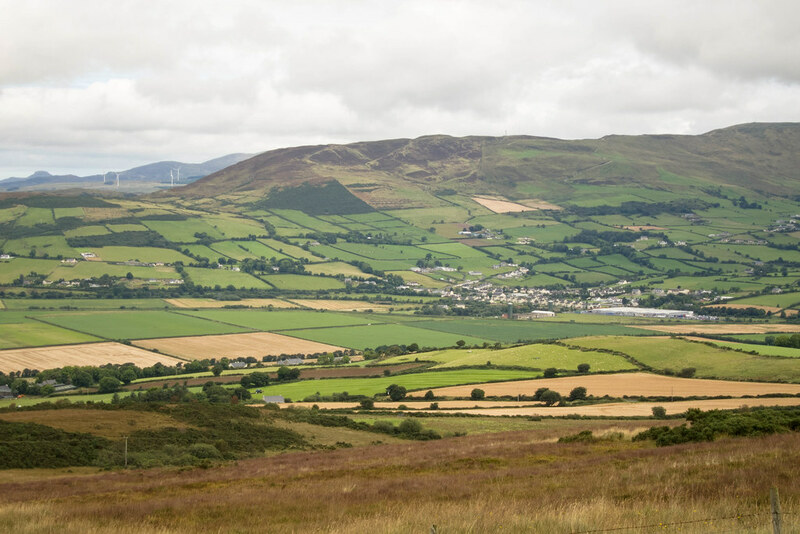 All across Ireland, we found the views to be stunning. 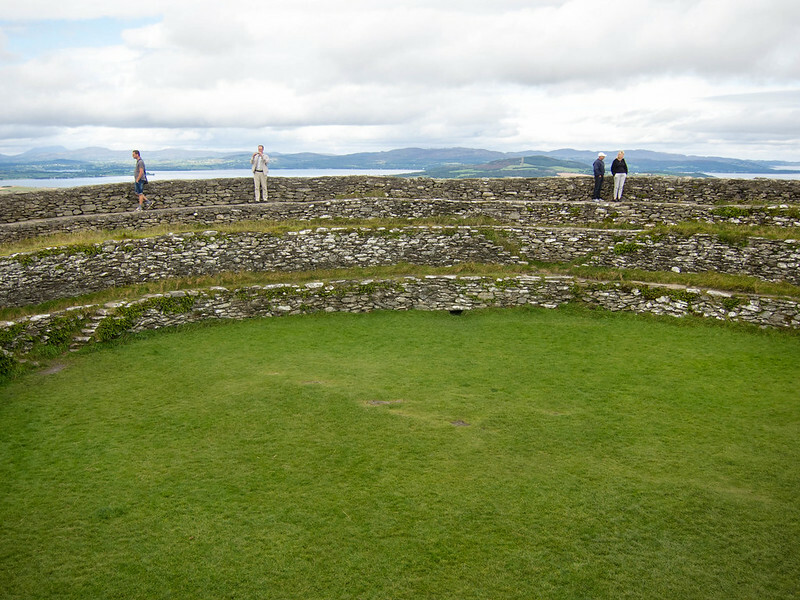 This is the view from the Grainan of Aileach, near Burt, in Co. Donegal.